The picturesque town of Guptkashi finds its place en route to the famous pilgrimage spot of Kedarnath and is located at an altitude of 1319 m above sea level. 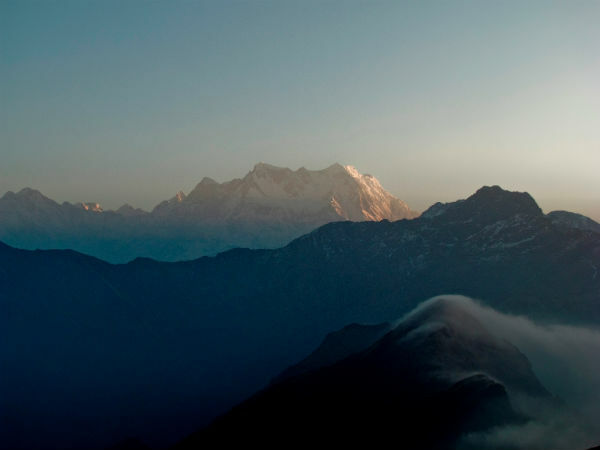 Guptkashi acts as a midway halt to Gaurikund and Rudraprayag, and is home to a number of temples.. One would come across the beautiful sight of the Chowkhamba Peak which stands tall amidst the temples of the region. Lying in the pristine settings of the place is some of the most worshiped pilgrimage destinations of the country. Apart from this, the place is home to a number glacial passes, unruly terrain along the exotic dry mountains which give you the thirst for more adventure. Guptkashi is one of those destinations which can be visited any time throughout the year, however,March to June and September to November are considered to be the best months to visit the place as the climatic conditions tend to be on the pleasant side. By Air: The nearest major airport is the Jolly Grant Airport at Dehradun which is located at a distance of 198 km from here. The airport receives flights from most of the major airports across the country with regular ones from Delhi, Kolkata etc. By Train: The nearest major rail head is the Rishikesh station which is located at a distance of 186 km away from the town. The station is connected to most of the major railway stations across the country and also across the state of Uttarakhand. By Road: One of the best ways to reach the place is by road, as Guptkashi offers excellent connectivity by road. There are plenty of buses which operate from major towns and cities from the state of Uttarakhand and also a number of them from Delhi. The total driving distance from Delhi to Guptkashi is around 434 km, which would take you about 11 to 12 hours to reach the place. There are three routes through which one can reach the town starting from Delhi, which are as follows. If you opt for Route 1, it would take you about 11 h to cover the distance of 434 km from Delhi to Guptkashi via the NH 334 and NH 7, which would take you through some well known towns such as Meerut, Rishikesh, Haridwar etc. If you opt for Route 2, it would about 12.5 h to cover the distance of 425 km from Delhi to Guptkashi via NH 7; if your choice the third route, it would take you about 12.5 h to cover the distance of 471 km via NH 44 & NH. Meerut is an ancient city which dates back to the Indus Valley Civilisation and is the second largest city in the NCR. The city is also known as the ‘Sports city of India’, as one would come across a large number of producers of various sports goods. It was in this city the 1857 rebellion against the British began which later influenced many other movements against the British rule in the various parts of the country. Located along the confluence of the holy Ganga and Chandrabhaga, Rishikesh finds its place at the foothills of the majestic Himalayas and is home to a large number of ancient temples, ashrams apart from adventurous spots. Over the years, the place has become extremely popular for not only its spiritual vibes and adventure sports but also for its association with the renowned music band the Beatles. Rishikesh is considered as a major hub of adventure sports in India as it offers some of the best options to quench an individual's thirst for White Water Rafting, Bungee Jumping, Mountain Biking etc. Some of the major places to visit here are the Lakshman Jhula, Neelkanth Mahadev Temple, Gita Bhavan, Triveni Ghat, Sivananda Ashram. Located on the banks of the Alakananda, is the beautiful city of Srinagar which is well known for its natural beauty and numerous temples. Out of the many, the shrine of Kamleshwar Mahadev is one of the most important one here which is believed to have been established by Adi Shankaracharya. Guptkashi in translation means Hidden Kashi. The place has numerous legends associated with it. One of the most popular is associated with the Mahabharata, when the Pandavas were searching for Lord Shiva, he is said to have first hid himself in Guptkashi before fleeing away further up the place to Kedarnath. The place is considered one amongst the 6 Kashis each considered holy. While Uttarkashi lies in Uttarakhand, the others are located in the various part of the country. It is commonly believed that a visit to any one of these shrines would reward one with happiness and prosperity. The place is also considered holy as it is located at the confluence of the two rivers Ganga and Yamuna. One of the most important temples in the town is the Vishwanath Temple that is dedicated to Lord Shiva. The shrine is considered as holy as the Kashi Vishwanath Temple at Varanasi and attracts a large number of devotees. It is believed that Lord Shiva conveyed his interest of getting married to Parvathi here, after which they got married to each other at the Trijuginath Temple in Rudraprayag. To the left of the main shrine, one would come across a shrine dedicated to Ardhanarishwara, which depicts Shiva in a half man, half woman form. Located close by the Vishwanath Temple is the Manikarnik Kund, which the place where the streams of Ganga and Yamuna merge together into one.